GIA Walkin Drive In Mumbai | Diamond Grader Associate Jobs | 28th and 29th November 2017. The candidates who had completed minimum 12th or any graduate can attend for this GIA Walkin Drive for the role of Diamond Grader Associate jobs. Freshers and experienced aspirants with good communication skills are most welcome. Contenders who have the ability to use gemological equipment can make use of this GIA Careers opportunity. Applicants can go through the below sections, to know more details about the GIA Walkin Interview. 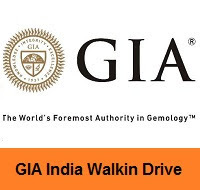 GIA India Laboratory has clearly mentioned that the candidates who satisfy all the given requirements are only eligible to attend for the GIA Walkin Drive. Before going to attend for the GIA Walkin interview, applicants should check GIA Placement Papers and GIA Test Pattern. These model papers and syllabus help the candidates to easily get placed in GIA. We suggest that check our website All India Jobs for accurate and current information about this recruitment. GIA is going to recruit the candidates to fill 5 vacancies in the position of Diamond Grader Associate. You can also check other Jobs in Mumbai on this website. Please carry all the important documents before going to the interview. Check job description, qualification details, and walkin details in the below sections. Shift timing: 7.30 am to 5 pm. CTC offered is 15,000 – 22,000 per month, net salary p.m. is around 12000 – 19000 (depending upon previous years of experience and salary. Other benefits – PF, ESIC, Mediclaim Insurance and Life Insurance etc. Centralize Pick and Drop facility. Education requirement: Min 12th or Any Graduate. Good Communication Skills & Ready to take new challenges. Perform the summative evaluation of diamonds in accordance with the International Diamond Grading System and document identifying features required for the initial draft of GIA Diamond Grading Reports. Personal accountability: learn and improve performance; ability to take personal responsibility for decisions, actions & outcomes. Technical knowledge: ability to learn, retain and apply grading knowledge. Service mindset: drive and motivation to meet production and quality requirements. Decision quality, Problem-solving: The ability to identify issues and know how to escalate an issue or to ask for guidance. Analytical skills: learn to apply analytical thinking and deductive reasoning to daily work; ability to learn to articulate the issues, reasoning to reach the initial evaluation of diamonds. Visual perception, depth perception, understanding of spatial relationship ability to map a 3-Dimensional object into. Ability to use gemological equipment to evaluate the diamond, and hand-held tools to manipulate diamonds. Time management skills: approach work in an organized and systematic manner. GIA is a local gem & jewelry industry since 2004. The first branch is opened in Mumbai. After four years it has a laboratory in Mumbai. GIA is located in Bandra-Kurla Complex, close to the Bharat Diamond Bourse in Mumbai. This company has an excellent team of experts from instructors, gemologists, and graders. Generally, this company laboratory takes care of the needs of makers all over the country. It offers courses and programmes in diamonds, colored stones, pearls, jewelry design and retail sales. GIA provides hands-on skills development relevant to the real world, leading to highly respected and recognized professional credentials. Interested and eligible candidates can attend for the walkin interview conducted at Mumbai on 28th and 29th November 2017 from 9 AM onwards. Candidates who want to work as a Diamond Grader Associate in Mumbai can attend for these GIA openings. We hope that the given GIA Walkin Drive information is useful for your job search. Keep visiting our website www.allindiajobs.in and bookmark this page for more walkin details, fresher jobs, etc.